LONDON.- The V&A’s autumn exhibition, Maharaja: The Splendour of India’s Royal Courts, will be the first to comprehensively explore the world of the maharajas and their extraordinarily rich culture. It will bring together over 250 magnificent objects, many on loan to the UK for the first time from India’s royal collections. The exhibition will include three thrones, a silver gilt howdah, gem-encrusted weapons, court paintings, photographs, a Rolls Royce, Indian turban jewels and jewellery commissioned from Cartier and Van Cleef & Arpels in the 20th century. The exhibition will cover the period from the 18th century when the great era of the maharajas began to the end of British rule in 1947. It will show the changing role of the maharajas in an historical and social context and look at how their patronage of the arts both in India and Europe resulted in splendid and beautiful commissions designed to enhance royal status and identity. Many of the objects have never before been seen in the UK. The royal collections of Udaipur and Jodhpur are lending several spectacular paintings and objects. The V&A is reuniting four portraits from the 1930s by Bernard Boutet de Monvel depicting the elegant Maharaja and Maharani of Indore. One pair depicts them in Maratha dress and the other in modern Western dress. They will be shown together on public display for the first time. Another object on show in the UK for the first time is the Patiala Necklace, part of the largest single commission that Cartier has ever executed. Completed in 1928 and restored in 2002, this piece of ceremonial jewellery originally contained 2,930 diamonds and weighed almost a thousand carats. The exhibition will begin with a recreation of an Indian royal procession with a lifesized model elephant adorned with animal jewellery, textiles and trappings and surmounted with a silver howdah. The initial displays will explore ideas of kingship in India and the role of the maharaja as religious leader, military and political ruler and artistic patron. Symbols of kingship will include a gaddi (throne) from Udaipur, elaborate turban jewels, ceremonial swords and a gold ankus (elephant goad) set with diamonds. A palanquin from Jodhpur used to carry the Maharaja’s wife will provide a rare glimpse into the lives of ladies at the royal court. The interior of the palanquin contains original framed prints and cushions. The next section of the exhibition will focus on the shifts of power and taste in the 18th and early 19th centuries. The disintegration of the Mughal Empire led to a period of political change in which rival Indian kings laid claim to territory. On display will be the golden throne of Maharaja Ranjit Singh, who united the warring factions of the Punjab into a powerful Sikh state, as well as weapons and armour owned by Tipu Sultan of Mysore and the Maratha ruler Yeshwant Rao Holkar of Indore. This period also witnessed the rapid expansion of the territorial interests of the English East India Company. This led to a new hybrid Anglo-Indian style which will be seen in objects such as a Spode dinner service and an Egyptian-revival style chair designed for the Nawab of Awadh. The exhibition will then look at the grand imperial durbars of the Raj through large-scale paintings and rare archive film footage. 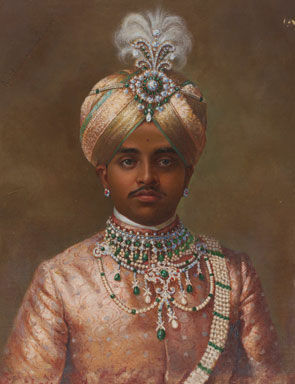 This section will include a carpet of pearls, rubies, emeralds and diamonds made for the Maharaja of Baroda and exhibited at the durbar of 1903. The final section will explore the role of the ‘modern’ maharajas during the Raj and the increasing European influence on their lives. The exhibition will show how they were portrayed in both Indian and European style through portraits of the maharajas and their wives by photographers and artists including Man Ray, Cecil Beaton and Raja Ravi Varma. 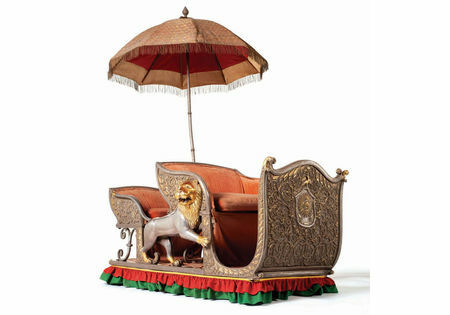 The maharajas’ patronage of European firms resulted in luxurious commissions. On display will be saris designed by leading French couture houses, a costume by Madeleine Vionnet, a diamond and emerald necklace designed by Van Cleef & Arpels, a Rolls Royce and a Louis Vuitton travelling case. 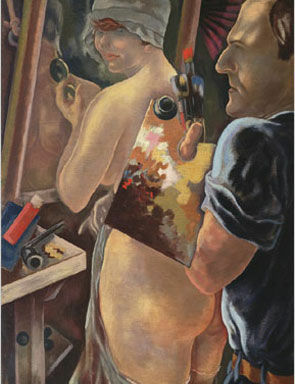 The maharajas were also patrons of the emerging European avant-garde. The exhibition will include modernist furniture commissioned by the Maharaja of Indore for his palace in the 1930s and architectural designs for the Umaid Bhawan palace, an Art Deco style residence commissioned by the Maharaja of Jodhpur. 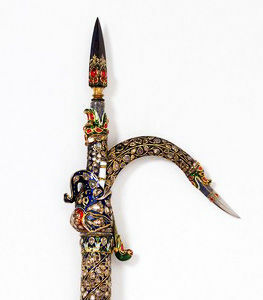 Howdah, 19th century. Courtesy of the Mehrangarh Museum Trust ©David Dunning.